Episode 047 JOKE THEORY PT. 2 - Harrison Greenbaum: "The secret algorithm of comedy" – Let's Talk About Sets! Episode 047 JOKE THEORY PT. 2 - Harrison Greenbaum: "The secret algorithm of comedy"
Harrison Greenbaum shows how he actually applies all his theories from part 1 of JOKE THEORY to his stand-up writing and performance. We go step-by-step through some of his best material, laughing and geeking out the whole way. It’s funny and fast-paced, and it builds on part 1. 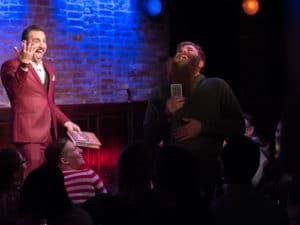 Harrison Greenbaum been featured on America’s Got Talent, Last Comic Standing, AXS.TV’s Gotham Comedy Live, along with many other TV appearances. He’s won numerous awards for his comedy, including the Andy Kaufman Award for creativity and originality in comedy, the Shorty Award from Comedy Central, and Best Emerging Comic from the New York Comedy Festival. He’s got writing credits up the wazoo, performs in over 600 shows a year, and on top of all that, Harrison also saws doves in half and conjures flocks of women into the air as magic. Or something like that. And a huge thanks to to our guest, Harrison Greenbaum! What a mensch. And Salt N’ Peppa, you complete my palate.